- With Whitney working a double on Saturday, meaning I'll be hanging out with Sarge, I decided to spend Friday physically beating the crap out of myself, which if you haven't figured out by now puts a huge smile on my face. - 5:15am, in the pool I went at the local athletic club, believe it or not I wasn't even the first one swimming, as one of the regulars was already floating up and down one of the lanes. The swim went just like it always does, slow and steady, coming in at a 2:01 / 100 yard pace. Click here for Garmin details, it has a stat called SWOLF, I have no idea what that means but I like how that word sounds! - Next up was a trip down to the cardio room to jump on the elliptical bike which luckily still hasn't broke yet, but sounds worse and worse as the weeks go by. The bike portion went well, I peddled hills for thirty-five minutes drenching my shirt in sweat for 12.4 miles. No data for this, the bike is old so it doesn't sync to my watch or phone, I did manually enter it in Strava and snap a quick finishing pic, click here. - The final indoor segment was a quick treadmill 5K in 20:30, with mile splits of 7:20 / 6:30 / 6:08. After the run I headed home for breakfast before making my way over to Wildcat Ski Area where I hiked up the ski slopes. Hiking up the ski slopes costs $10 for an uphill pass, if you have a season pass this covers hiking access too. - I started hiking just after 8:30am, giving me a solid half hour on the slopes before skiers and boarders came zooming on by. I have hiked up the slopes in winter on a few occasions so I know what to expect and where to avoid blind corners to not startle or upset oncoming skiers and boarders. - The weather was all over the place this morning, snowing for a majority of the hike up and very windy at times. Luckily, temperatures were hovering around freezing so it was easy to stay warm hiking uphill while making it to the summit tower in a little over an hour. Since there were no views along with a steady wind blowing I snapped a few pics before high tailing it back to the slopes for a quick hike back down. 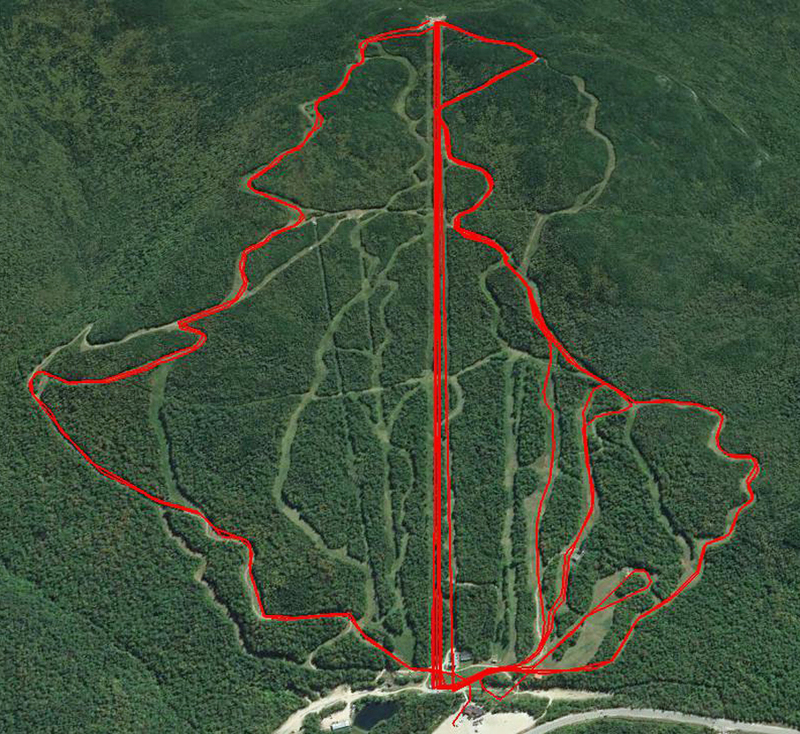 - It was a relatively quiet hike along the ski slopes Friday morning, I expected the trails to be a little more crowded because it was the last week day operation for Wildcat, only staying open on weekends from here on out. Click here for Strava hike details. - Once back down I hustled over to my Jeep and did a quick wardrobe change into dry layers along with putting my snowboard boots and jacket on. Within minutes I was back to the slopes and on the chairlift to the top for some bunny slope action! - 10:45AM, I started my first run, basically retracing my steps from my hike along the Polecat Ski Trail, with a few small deviations here and there. Conditions were excellent for April 20th, great coverage and some wind blown snow over the groomed trails. The first couple of turns felt odd as my legs were definitely not expecting a totally different movement and balancing on the board compared to hiking. However, within a minute my body caught up to what my mind wanted it to do and I easily made my way down the gentle grades of the Polecat Ski Trail. - Over the next two hours I got in seven fun and laid back runs, I ended up doing two runs of Polecat, two runs of Catapault - Wildcat - Wild Kitten, which was excellent, two of Catapault - Wildcat - Cheetah, and one of Catapault - Wildcat - Bobcat, which was my favorite run of the day. Click here for Strava details. - After my last run I wobbled over to the Jeep and made the short ten minute drive back home to stuff my face with food, catch up with Whitney before she headed to work, and to hang out with Sarge. Wildcat D Peak summit tower is reached via a short section of the A.T.
My old reliable snowboard (K2 Access Wide 2005) and my trusty Jeep! South Moat Sarge, from two weeks ago before winter came roaring back!